A Boutique Real Estate Brokerage Company offering a high level of service to its clients engaging in the sale and or purchase of Real Estate. Nickolas Dalba Real Estate will also act as a resource for those engaging in the new construction process extending our extensive expertise in both structural and interior design, vendor origination and project management. Description: A home for all seasons! 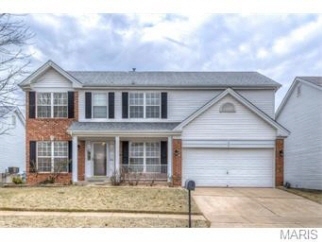 This spacious two-story has it all – great curb appeal; an outstanding location inside the 270 loop; fabulous community amenities – pool, clubhouse, water features & parks; award-winning pattonville schools; & loads of premium features. Formal living & dining rooms flank the foyer & a switchback rear staircase creates plenty of open space for entertaining, from the fireside family room to the bayed breakfast room & luxury kitchen, fully equipped with refrigerator, range & dishwasher. Upstairs, the master bedroom is vaulted & served by a luxury master bath, with double-bowl vanity, corner tub & separate shower, & the second-floor laundry is convenient to all four bedrooms. On the lower level, a full bath rough-in allows for future expansion. With its patio, planting beds & fully usable backyard, this home is definitely a winner!